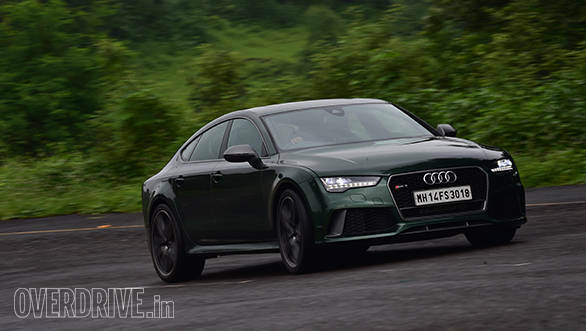 The last time I drove the Audi RS7, it had left me very impressed. It wasn't a hard feat for the car. Back then we had driven it down to Bangalore to collect and review a Lamborghini Aventador. That humongous bull had a ground-hugging belly which forced it to avoid any road that had speed humps, and Bangalore has plenty of them. Instant buzzkill. In comparison, the Audi RS7 felt more practical. It had travelled all the way from Mumbai without having to avoid any road and carried four in comfort and their luggage. Despite being practical, it had some mind-boggling numbers to boast of - 0-100kmph in 3.9s, top whack of 280kmph and the fact that it was the most powerful production Audi at that time. There's no denying that the Aventador with its mighty V12 heart is in a different league, but it's amazing how close the RS7 comes to supercar numbers. 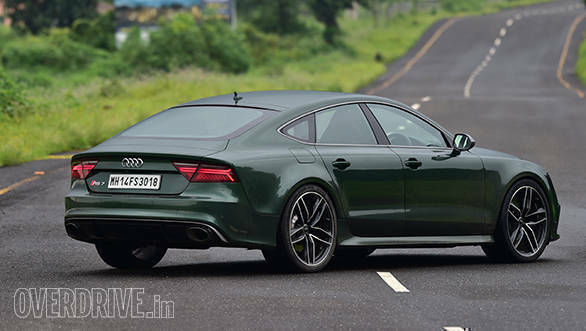 Now there is a new one - the Audi RS7 Sportback Performance. 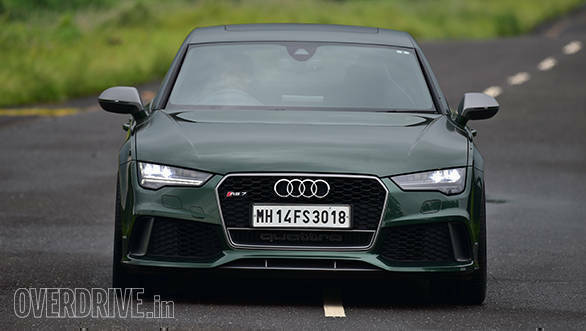 Not entirely new, but enough to attract the attention of anyone wanting to spend a little under Rs 2 crore on a quick family car. Visually, there isn't much to differentiate the Performance variant apart from a few brushed aluminium accents here and there. With its coupe roofline, new tail lights and the shade of dark green you see here, I was asked on multiple occasions if this was a Jaguar. Ironic that some people are well-informed to mistake this colour for the Jaguar racing green but can't identify this car as an Audi in the passing glance or when seen from its side profile. 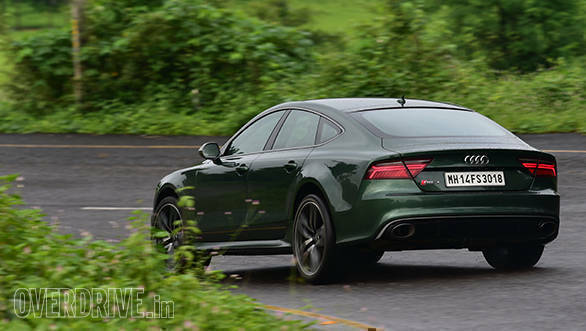 But truth is that India hasn't shown much love to four-door coupes yet, so even the Audi A7 (let alone the RS7) isn't a common sight on our roads. 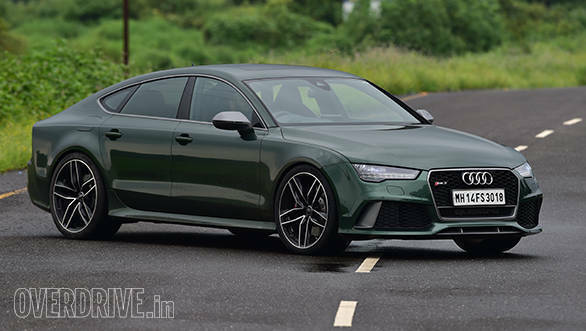 Bright side then is that the Audi RS7 enjoys exclusivity, and its target audience in India appreciate that sort of a thing. 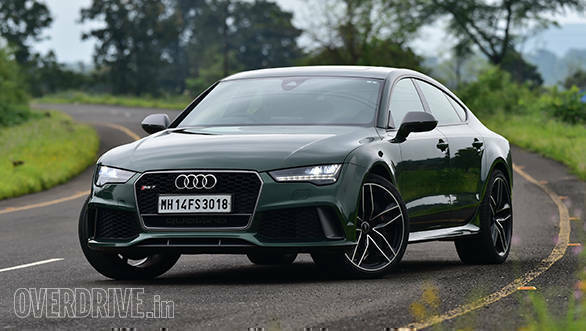 The Audi RS7 Performance may not bring in big numbers for Audi, but has the mechanicals that could keep you quite happy if you decide to spend on one. 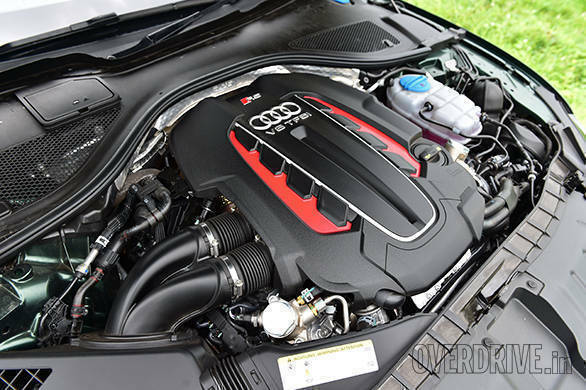 Its 4.0-litre TFSI mill now revs higher by up to 200rpm, and while doing so it also produces 45PS more power, taking the total from 560PS to 605PS. Unfortunately, it's just a tiny bit shy of claiming to be the most powerful production Audi around. That crown now belongs to the new Audi R8 V10 Plus (read our road test review here). But the RS7 Performance does not give up easily as the additional power has lowered the sprint time to 3.7s. Interestingly, we clocked the exact same timing on our test car in the first go itself and on regular 95 octane fuel! But frankly, I'm not too astonished any more. Blame it to the Audi TT RS I drove around the same time, which does exactly similar time with a 2.5-litre engine and 200 horses less. Of course, the TT RS is a pint-sized sportscar while the RS7 is a two-tonne four-door coupe. But while the numbers are commendable, the way it achieves them isn't very dramatic. The TT RS feels fast with all cylinders firing, and everything working towards giving you the edge of the seat entertainment. The RS7 seems to achieve everything effortlessly. You build up speed and watch the scenery change form rapidly, but the car behaves as if it is just peacefully fluttering around. Even the sound of the engine seems subdued for what it is - a V8! The RS7 even looks the part now with the new matrix lights giving it a stone-cold smug face - the kind who would not even acknowledge your presence. The steering system contributes to that effect too. It can change weight as per the driving mode you choose but won't communicate much with you. The front end, therefore, feels floaty even if you are in the driving in the Dynamic mode. Furthermore, the RS7 Performance continues to have the same understeer-y nature as most RS models and that is the price you pay for the grip that the quattro all-wheel drive system offers. You need to the take the inherent understeer into account when negotiating bends or making high-speed lane changes. There is also plenty of mid-range torque, meaning that you need to know exactly how much and when to go on the gas again when tackling corners. Gas it hard and you will experience torque steer that will deviate you from the intended line. The workaround, instead, is to carry enough pace through the bend and power out when the car is pointing to the intended direction. You will love the way the quattro grip shoots the car out of the corner. There is hardly any roll too, so the body remains flat and balanced. Speaking of torque, the RS7 Performance gets an interesting 'overboost' function. The engine stores away up to 50Nm of torque that can be used to temporarily boost performance. So while an already healthy 700Nm is available between 1,750-6,000rpm, the overboost function feeds an additional burst of torque to aid the mid-range when the situation demands it. The result isn't noticeable when driving the car, but the better roll-acceleration makes itself evident on the test equipment. For example, 40 to 100kmph comes up in less than 3s. 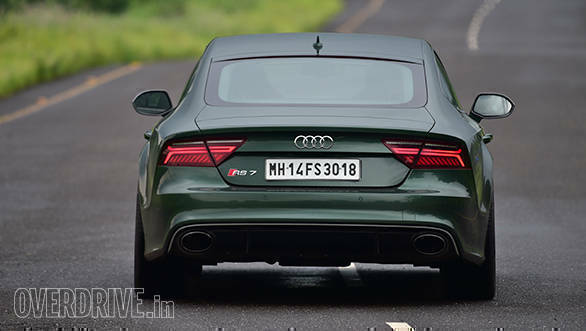 Despite all those figures, a claimed top whack of 305kmph and the little drops of fuel that the car sprays into the exhaust system to create those crackles and pops, the RS7 Performance claims to be the cleanest car in its lot with CO2 emissions of 221g/km. That is provided you get the right quality of fuel. 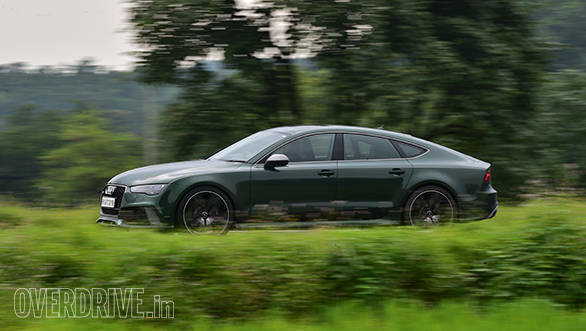 Speaking of which, the fuel quality will also make a difference to the performance figures, which in themselves are only a marginal increment over the regular RS7 Sportback. 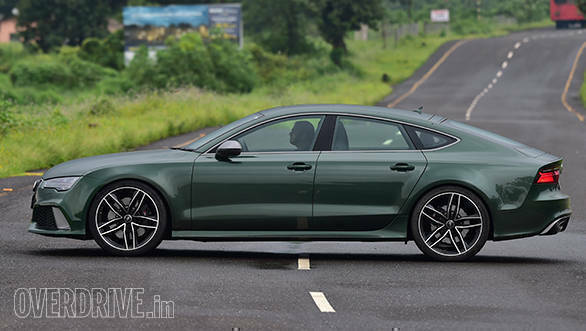 In the real world, in fact, the incremental power doesn't make any noticeable gain over the RS7 Sportback. The Performance edition then feels just as good (or bad) as the regular RS7, but what it does better is massage your ego and give you the bragging rights of owning a family car that has the kind of numbers that are usually the birth right of a supercar.